Garage: Double, Attached "Over sized"
The "ONE" you have been waiting for......in sought after DOWNEY RIDGE...4 BEDROOM bilevel with FULLY FINISHED WALKOUT basement!! Recently RENOVATED KITCHEN with CORIAN countertops and NEW LAMINATE flooring throughout the main level. Open and spacious main level includes living room, dining area, kitchen, generous sized master with 3 piece ensuite and a second bedroom. Off the dining area is your "Treehouse" deck for quiet relaxation in the evenings and watching the kids in your above ground pool. FULLY FINISHED WALKOUT basement has two more bedrooms, 4 piece bathroom, family room and laundry area. Oversized double attached garage easily accomodates a full size pickup. Underground sprinkler system. 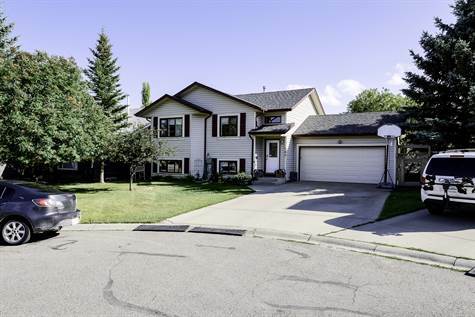 Great neighbors, quiet cul-de-sac, CLOSE to SCHOOLS and RECREATION CENTRE...2 minute walk to CALGARY COMMUTOR BUS pick up location.....move in ready and quick possession....be settled for the new school year!! Book your private vewing today! !